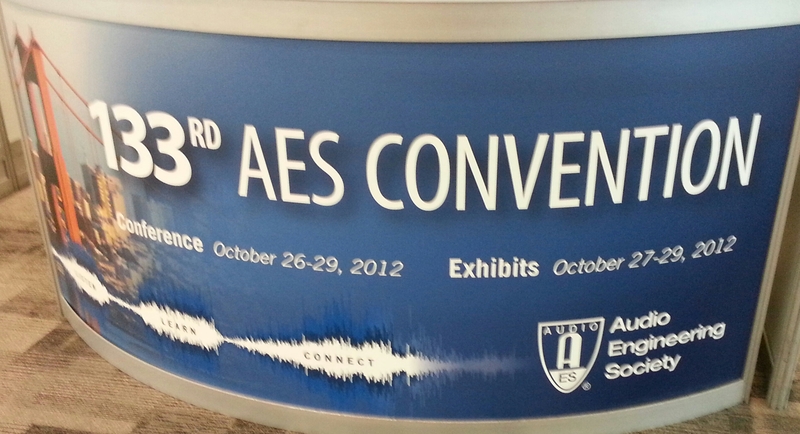 Yesterday at the AES Convention in San Francisco I went to a presentation about the history and physics of recording analog on magnetic tape. Seeing oxide on a microscopic level was fascinating, but the question and answer period revealed a real gem. A question about erasing tape provoked presenter Jay McKnight to give his explanation for the “wub-wub-wub” sound of analog tape in fast transport. I remember that sound from my first studio job. The tape could be otherwise completely blank but during high speed transport with the faders up you could hear this low frequency oscillation. Jay said he can’t prove this (yet), but it is his opinion that when you erase the tape (via erase head or bulk eraser) the audible spectrum acts as a bias for the magnetic field of The Earth. In fast transport the frequency gets fast/high enough to allow us to hear the magnetic flux of our planet. Whether he can prove it or not, I get goose bumps at the idea. I’m rounding up posts about the convention.